It’s a mightily evocative name to choose but their music, typically Swedish electro-pop (of which there is a surfeit) but with much more to it, is appropriately vivid, powerful and well produced with two well-matched voices. Gabriel in particular has a lyrical vocal, not quite androgynous, where you can’t quite tell if the singer is male or female. He has had to tone down his typically theatrical delivery for these songs. 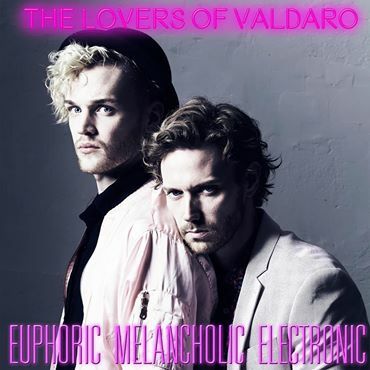 The Lovers of Valdaro released their first single ‘Lost Forever’ in April and won a spot as the opening performers at Melodifestivalen 2019 with a Radio P4 Nästa performance of it, partly because of a very visual stage show, which they promise for the Melodifestivalen competition, which is Sweden’s entrée into the Eurovision Song Contest, the winning song being the country’s representative. The band had their first show at Stockholm Pride/Europride. They follow up with this EP consisting of four tracks and including a version of Nick Kamen´s ‘I Promised Myself’ which isn’t that far removed from the original. They describe their music as “euphoric, melancholic and electronic”, hence the title. EME is something they’d like to develop, acronym and all, as a new ‘genre’. Heartbreak songs with lyrics that welcome scrutiny. Euphoric, Melancholic, Electronic will be self-released on September 7th.